I can’t tell you how many times a day I hear the same, common thread among patients in their 50’s, 60’s and 70’s. Well I’ll share a little secret with you. 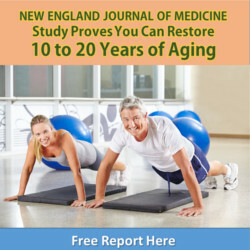 Aging – the passing of years – isn’t the reason most people start feeling older and sicker. It’s chronic inflammation. The connection between inflammation and poor health is so closely linked that today there’s even a term for it: Inflamm-aging. And it’s a scourge that’s running rampant here in the U.S. Persistent inflammation plays a role in almost every chronic degenerative disease associated with getting older. Arthritis is a prime example of inflammation run amok. It’s also linked to heart disease, stroke, cancer, Alzheimer’s and asthma, just to name a few. Like most of my patients, you probably already know that sugars, packaged foods, processed meats and fried foods all produce an inflammatory response in your body. What you may not recognize is that many healthy-sounding foods do the same. Omega-6 fatty acids sound like they’re good for you, but they aren’t. These inflammatory fatty acids compete with inflammation-fighting omega-3s to take up space in your tissue. And when they outnumber omega-3s the consequences can be devastating – promoting heart disease, cancer, osteoporosis, autoimmune disease and premature aging. Choose your sources of omega-3 rich fish carefully. There is a huge difference between wild-caught and farm-raised fish. When you buy farm-raised, you expose yourself to all sorts of inflammatory compounds. The most common are polychlorinated biphenyls, which have a direct link to obesity and diabetes. Tip: Always invest in high-quality, wild-caught fish for your meals. “Nourishing” whole grains may not be as wholesome as they sound. These days everyone is rushing out to buy more nourishing whole grains as if their life depended on it. If you’ve been caught up in this craze, I urge you to stop right now. Sure, they sound so wholesome… if only they weren’t loaded with an inflammatory protein that you’ve heard a lot about in recent years: gluten. Plus the use of glyphosate on the soil pre-planting or on the wheat itself is widespread on U.S. farms. Tip: Grains that contain gluten include wheat, barley and rye and should not be a part of your diet. Amaranth, buckwheat, millet and quinoa are much better choices if you want to slash inflammation. Dairy is not the healthiest source of calcium in your diet. I notice that a lot of patients still place a lot of faith in dairy products to supplement their calcium needs. But that’s a bad idea. As a result, all of those undigested sugars end up fermenting in your colon where they create a state of chronic inflammation. Plus, commercial dairy products are full of drugs, hormones(rBGH) and antibiotics that can easily provoke an inflammatory response. Tip: Almond, coconut or rice milk are all great alternatives to cow’s milk. Broccoli, kale, turnip greens and arugula all have high calcium content, too. This is the short list. And clearly, making just a few simple changes in your diet can count for a lot when it comes to fighting off inflammation and slashing your chances of age-related disease. But while you are doing that I have a quick, easy and inexpensive way to help you soothe inflammation at the source. It’s a simple tip that puts smiles back on my aging patient’s faces… and helps them feel young again. One of my favorite spices is turmeric. This vibrant yellow spice is loaded with a powerful antioxidant called curcumin that can help you put the brakes on all sorts of health problems associated with aging. And medical science is proving it, over and over again. Curcumin also shows great promise in the fight against cancer. Research suggests it might prevent precancerous cells from turning into full-blown cancer. That it could even kill cancer cells in their tracks, and stop more cancer cells from growing. When you combine this life-giving spice with other herbs like rhodiola rosa and ashwagandha, it goes to work even further to reduce your inflammatory response. These two adaptogenic herbs slash stress and anxiety levels that spur your body’s production in inflammatory compounds. They keep you calm, cool and collected. If you need a little help shutting down the fire that is burning inside of you… the chronic pain, inflammation and stress that may be contributing to your health issues… check out this ultimate anti-inflammatory compound that I helped my friends at Uniscience Group produce. Patterson E, et al. Health implications of high dietary omega-6 polyunsaturated Fatty acids. J Nutr Metab. 2012;2012:539426. Schecter A, et al. Perfluorinated Compounds, Polychlorinated Biphenyls, and Organochlorine Pesticide Contamination in Composite Food Samples from Dallas, Texas, USA. Environ Health Perspect. 2010 Jun;118(6):796–802. Lebwohl B, et al. Long term gluten consumption in adults without celiac disease and risk of coronary heart disease: prospective cohort study. BMJ. 2017; 357: j1892. Itan Y, et al. The Origins of Lactase Persistence in Europe. PLoS Comput Biol. 2009;5(8): e1000491. Chandrasekhar K, et al. A Prospective, Randomized Double-Blind, Placebo-Controlled Study of Safety and Efficacy of a High-Concentration Full-Spectrum Extract of Ashwagandha Root in Reducing Stress and Anxiety in Adults. Indian J Psychol Med. 2012 Jul-Sep; 34(3): 255–262. Olsson EM, et al. A randomised, double-blind, placebo-controlled, parallel-group study of the standardised extract shr-5 of the roots of Rhodiola rosea in the treatment of subjects with stress-related fatigue. Planta Med. 2009 Feb;75(2):105-12. This entry was posted in General Health and tagged best supplements for inflammation, do omega-3s stop inflammation, does curcumin really stop inflammation, foods that cause inflammation, foods that stop inflammation, how do I know if I have chronic inflammation, how to reduce inflammation, is inflammation related to aging on April 15, 2019 by wellness.